2019 PA Nordic Championship Race Recap! 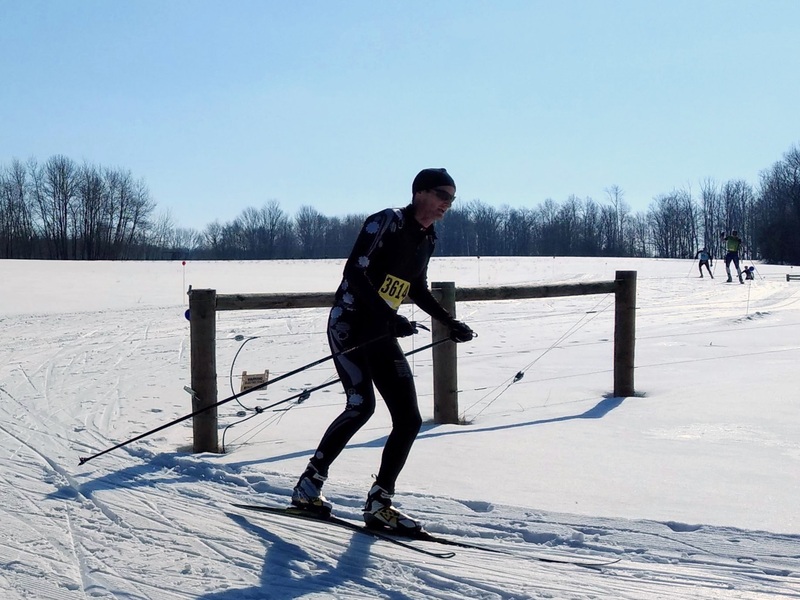 After suffering a cancellation in 2018 due to poor snow conditions, the February 3, 2019, edition of PACCSA’s Pennsylvania Nordic Championships went off without a hitch! For the fourth time in the event’s history, the races took place at Wilderness Lodge in Wattsburg, PA, and drew a large crowd of skiers from Pennsylvania, Ohio, Maine, Maryland and Virginia! Early weather predictions calling for a rainy race-day evaporated, allowing skiers to enjoy mild temperatures and sunny skies on Wilderness’s beautifully prepared trail system. The day kicked off with the 5k Classic under overcast conditions and temperatures in the mid 30’s. The course remained relatively fast due to recent sub-zero temperatures that had left the ground frozen solid. In the Women’s 5k Classic, Pittsburgher Irina Niederberger showed impeccable form in securing victory with a time of 26:26. Taking second was the 2017 classic-race winner Melanie Nickou (27:07), with PACCSA standout Naomi Jarvis taking third (36:23). The Men’s 5k Classic proved to be the most closely contested race of the day with Ohio Nordic’s Michael Schaefer and past champion Jim Samuels fighting neck and neck for the win. At the finish line, Schaefer won with a time of 22:39, with Samuels finishing right on his heels (22:41). Third place was earned by Edinboro native Bill Mathie (23:00). Immediately after the Classic races, the adult competitors took a breather to watch enthusiastic youngsters participate in 1.2k Classic and 2.4k Freestyle races. The Girls 1.2k race was won by PACCSA Yellowjacket Estelle Fisher, with Wilderness skier Emily Bloeser taking second and Yellowjacket Livia Monaco taking third. In the Boys 1.2k, Yellowjacket Roberto Novelli won, with fellow Yellowjacket teammates Anthony Kuntz and Oscar Atkinson sweeping the podium. In the 2.4k Freestyle competition, Wilderness Lodge’s own Tenley Janes streaked to victory in the girls race. For the boys, PACCSA Yellowjacket Matthew South skied with spirit to take the 2.4k win. Completing the podium were the speedy Wattsburg siblings of Ronan Callihan (second) and Daxton Callihan (third). PACCSA salutes all of the youth coaches and families in our region who are responsible for introducing this sport to the next generation of cross-country skiers! In the Women’s 10k Skate, Fairview’s Desiree Terella won in a time of 37:39. Desiree was followed by Ann Morris of Erie (44:17) and Sherry Mason of Cochranton (52:28). The Men’s 10k Skate was won by Ohio Nordic’s Mike Foley in 35:35 with President Judge John J. Trucilla of Erie coming in second (36:44) and Peter Scacheri in third (37:13). The Youth 5k Skate win was taken by PACCSA Yellowjacket Alessandro Novelli in a time of 32:35. The Women’s 20k Skate race featured defending champion Pamela McCormick of Erie who overcame the slow conditions to repeat as “Pennsylvania Nordic Champion” with a time of 1:10:33. She was followed by runner-up Kathy Schwenk of Corfu, NY (1:12:14) and third place finisher Irina Niederberger (1:25:44…her second podium finish of the day). In the Men’s 20k Skate, 2015 champion Sheldon Degenhardt of Marriottsville, MD, wasn’t daunted by the wet snow and passionately reclaimed the title of “Pennsylvania Nordic Champion” with a 1:06:10 finishing time. Ohio Nordic’s Michael Schaefer finished second (1:08:09….his second podium of the day), and Jay Hole finished in third (1:10:12). PACCSA extends its appreciation to everyone who competed and congratulates Sheldon Degenhardt & Pamela McCormick, the 2019 Pennsylvania Nordic Champions! To view the full list of results for all of the races, click here. After the races were completed and awards were received, participants stayed for additional prizes such as ski bags from Fischer Sports, waxing gifts from Fast Wax, Gift Certificates from Hazelbaker’s Outfitters, and a special ski rack donated by Skike PA. Every racer also received a cool buff donated by Thick Bikes of Pittsburgh! Congratulations to Race Director Brian Joly and all of the hard-working PACCSA volunteers who made this event a success. PACCSA also extends a special thanks to the following partners and sponsors: Cycle Sport & Ski of Greensburg, Erie Sports Commission, Findley Lake Sporting Goods, Fast Wax Ski Wax, Fischer Sports, The Law Offices of Frischman & Rizza, Hazelbaker’s Outfitters, Miles of Smiles Timing Services, REI, Skike PA, Thick Bikes of Pittsburgh, Road ID, United States Ski Pole Company and the Erie Wingate by Wyndham. Last but not least, PACCSA expresses enormous appreciation to Wilderness Lodge, the Janes family, and their staff for being excellent hosts and providing top-notch grooming.